We are back from our mini-vacation in Pennsylvania. I had one of the best times hanging out with my family, antiquing, celebrating birthdays and Independence Day. It was so great! While home, I had a hand in some makeovers. First, I made over my moms blog. She wanted something simple but something that also showcased her quilts. She is an avid quilter and makes such beautiful things. We were able to take some gorgeous photographs of her work and then incorporated them into her blog header. I also made her blog three columns. Head on over to check out her new look. She also did some makeovers herself. Then it was on to my sister, Jenn's, blog. Jenn is an amazing cook and baker. She belongs to a group of bloggers called The Barefoot Bloggers. Each week they make one of Ina Garten's recipes and share what they liked and didn't like about the recipe. Let me tell you, I wish I lived closer so I could have some of the leftovers! For Jenn's blog, we incorporated some soft colors and gave it a vintage, sweet vibe. I also changed her blog into a three-column as well. But I wasn't done with Jenn yet. She wanted some help redecorating/arranging her house and I told her the "payment" for redoing her blog (as if I would ever make her pay!) would be to get to redo her living room and kitchen. She also had me fix up her entryway too. We changed the whole orientation of her living room. We moved around accessories and edited for a new look. Then it was on to the kitchen. Jenn doesn't have a lot of space in her kitchen. She only has one drawer in the kitchen and that holds her silverware. The rest of her items must be stored in the cupboards. Well, I threw some organization into the mix and ended up finding so much more space! We changed things to make her kitchen function much better for her. As a cook, she needed the space and the organization to make things easier. Wouldn't you know that I have no pictures of the transformation! But she does! She'll be posting the transformation over at her blog. So head on over to check it out. I had a bit of a makeover on myself too. I chopped my hair off! Well...I didn't. A beautician friend did. But let me just say, I love it!! I've had my hair short for years...and it wasn't until I got engaged that I decided to grow my hair out. I was always struggling with it so finally, I took the plunge and got it chopped. I'm so happy with it! Our laundry room is sort of on a makeover hiatus. Here is the eyesore that is my laundry room right now. Shane has much bigger plans than paint and accessories...so currently, the washer and dryer are in their boxes collecting...stuff. We need to replace drywall on two walls in the room. We are also deciding if we want to put in a utility sink. So, hopefully...fingers crossed...work gets done on this project soon! And my last bit of makeover news comes from the world of television. Extreme Makeover Home Edition was filmed in Erie, Pennsylvania - right near my hometown! It was incredibly exciting to learn this bit of news. Mary J Blige even came out for the event. Crazy! You can read about it here. Hope everyone had a wonderful holiday and is enjoying summer wherever you are. I sure am! I love the headers you made for their blogs and I love your new hair cut. Please come redo my kitchen and living room. Your hair looks fab! I have my hair short as well. I used to wear it LONG, like down to my waste, but it was so tedious taking care of it! I'm wanting to get some side swept bangs to freshen it up a bit. I may try to cut them myself. LOVE the new looks! You should do this for money! What you did looks awesome, and so does your hair. You're lucky you can wear it both ways. Mandi, you look great!! I love the new banner and your updated blog. You seem like you had a good time back here in the states. Hope you laundry room get's finished soon.. can't wait to see that beautiful washer and dryer in place! Your hair looks really cute! 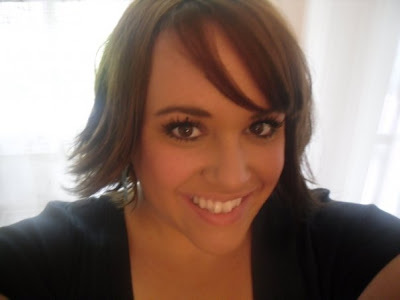 I LOVE LOVE LOVE YOUR blog headers and your adorable new haircut! I hope that your laundry room remodel moves quickly because I know you're dying to use those new LG's!! I can't wait to hear what you think of them! You are quite the talented blog makeroverer! I love the header for your mom's blog. I have heard about the Barefoot Bloggers, haven't been by there in awhile! Glad you enjoyed your vacation. Oh my gosh! Your sister's blog header is adorable!!!!!!!! Oh I love, love the multiple make-overs that you did, each one unique and creative. Your new *do* is so cute...when you get going you really go!! That laundry room will be fun when you get to actually doing the arranging... anxious to hear about the LG washer/dryer, I love my new LG Frig and can't wait to change over all of my appliances... waiting for them to die on me :>)!! Thank you so much for coming and helping me reorganize and redecorate. I really appreciated the help. You're very talented! The blogs look great. First, I love your haircut!!! Hmm, maybe I should cut mine the same. Those blog headers are amazing. I wish I was talented enough to do my own blog headers! Loving your blog.